The changes that the AT&T Galaxy Note brings include a different chipset, LTE connectivity and the four capacitive buttons, which replace the two-touch-plus-one hardware combo that we saw on the international version. Verizon’s Galaxy Tab 7.7, on the other hand trades the GSM/HSPA support for the speedier CDMA/LTE combo. In case you need a refresh, the Samsung Galaxy Tab 7.7 features a 7.7-inch Super AMOLED Plus screen (1280x800px), Exynos platform (1.4GHz dual-core ARM Cortex-A9 CPU, Mali-400MP GPU, 1GB RAM), a 3 megapixel camera with HD video recording, 16/32/64GB storage and microSD slot. The thing runs on Android Honeycomb with TouchWiz modifications. 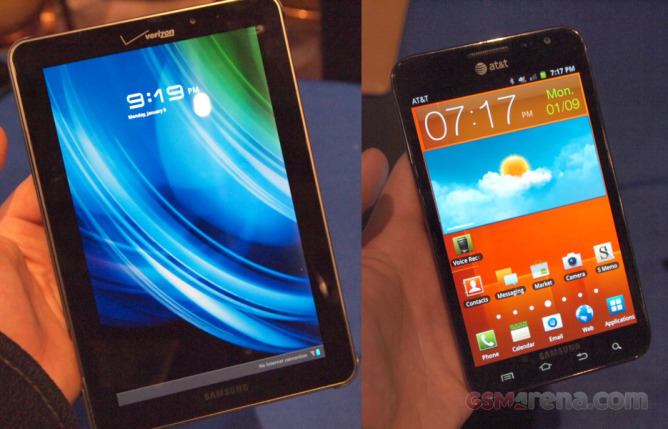 If you want to learn more about the Galaxy Tab 7.7, check our preview article. You can find our in-depth Galaxy Note review right here. There is still no info on the pricing and the exact availability of either gadget.